We all want a beautiful smile with healthy teeth. Unfortunately, tartar and plaque can build up leading to decay and damage to the tooth. When this occurs, dental fillings are needed to restore the teeth to their proper form and function. 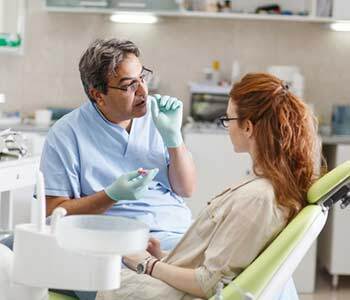 For patients in the greater Philadelphia, PA area, Dr. David Spilkia offer composite tooth fillings to restore teeth in an aesthetically pleasing fashion. As newborns, we are not born with bacteria in our mouths. Bacteria enters and accumulates over time. Once the bacteria enters the mouth, they feed off the food particles that remains on our teeth. It is up to us to control the bacteria and plaque by brushing and flossing before the bacteria eat away at the teeth and cause decay. Our bodies have amazing abilities to heal themselves, but the same does not hold true for teeth. When decay occurs and a hole is present, the tooth cannot heal itself. The problem must be diagnosed and treated before it spreads into a more severe issue such as tooth pain, infection, or tooth loss. When addressed early, decay or cavities are easily treated. Dental fillings restore teeth with cavities. Once placed, the tooth regains its natural function. When a cavity is detected, the dentist removes the damaged section of the tooth. The area is cleansed and then filled with the chosen material. This closes off the hole and prevents bacteria from causing more damage. Filling materials include gold, porcelain, amalgam, and a composite resin. Amalgam and composite resin are the two most commonly used fillings. Also known as silver or mercury fillings, dental amalgam fillings contain a combination of metals, generally mercury, silver, tin, and copper. Mercury is the binding agent that forms the mixture into a durable material. Amalgam fillings have been used for over 150 years. Although they are sometimes considered less expensive, easy to insert, and durable, they do contain mercury and cause a gray discoloration in the teeth. Composite tooth fillings are metal-free options to restore decayed teeth. Sometimes called tooth colored fillings, composite fillings are a mix of glass and plastic. They are white in color and closely match the natural teeth making these fillings a cosmetically pleasing option. 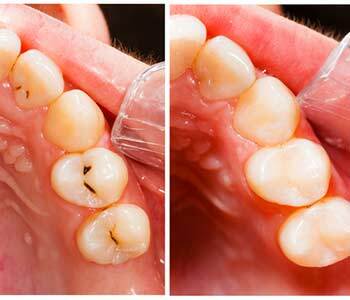 Composite resin fillings are used to restore decayed teeth. The material has a modeling clay consistency which is then hardened using a bright blue light. The dentist positions the light over the tooth and the filling is cured and hardened in about one minute. The material provides a durable, long-lasting solution for treating cavities. Composite fillings have gained popularity because they maintain the natural appearance and are safe to use. Aesthetically pleasing – Amalgam fillings make the tooth appear gray in color. From a cosmetic standpoint, composite fillings mimic natural enamel and blend in with the tooth. This makes them less visible to the public than silver fillings. The material can also be used to treat cavities in the front or back of the mouth. Durable – Composite tooth fillings bond easily to the teeth. Once hardened, they create and maintain a strong surface. The sturdy material helps prevent breaking and insulates the tooth from changes in temperature. Form and function – Dental fillings restore the damaged teeth to their normal form and function. The chewing surface is stabilized so patients can continue their regular eating habits. Maintains the natural tooth – Before a filling can be placed, not only is the damaged portion of the tooth taken out, but a section of the natural tooth is removed also. This can weaken the overall tooth structure. However, less drilling and preparation is needed for composite fillings. These fillings bond easily to the teeth and strengthen their structure. Safe – Composite fillings do not contain mercury or other metals. The composite resin is biocompatible for patient use. Less sensitivity – Compared to amalgam, composite fillings result in less tooth sensitivity. The resin material better insulates the tooth against hot and cold temperatures. Dr. Spilkia offers comprehensive dental care for the whole family. Contact the team at David Spilkia Family and Cosmetic Dentistry in Philadelphia, PA for an appointment. Call (267) 463-2777.